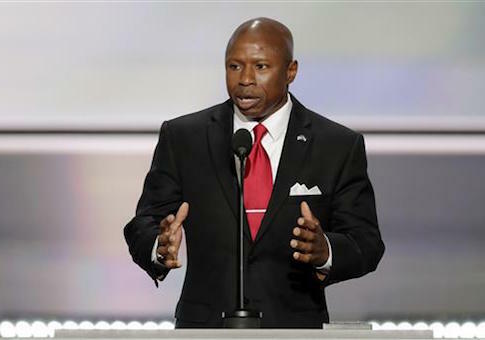 BOULDER, Colo.—Darryl Glenn is answering questions from a group of college Republicans about poverty, religious liberty, Black Lives Matter, and culture. It’s difficult to hear him over a rendition of Rihanna’s "Disturbia" by an all-male a cappella group practicing in the classroom nextdoor. "I feel like I’m in an episode of Glee," he joked. Glenn’s ease with potential voters and charismatic nature make it easy to see how he captured the nomination for Senate in Colorado in a crowded Republican field. Glenn met with the young Republican group after being the featured guest at a conservative documentary screening at University of Colorado Boulder, part of his grassroots, "hit every venue" strategy to unseat Democratic incumbent Sen. Michael Bennet. "That’s why I’m here, to get you guys excited about participating in these elections," he told the students. "Because it’s so easy to just say, ‘Forget it, I hate all these candidates, they’re all corrupt, we’re not going to get involved.’"
Glenn doesn’t mention Donald Trump or Hillary Clinton. When asked about whether he—a lesser-known county commissioner, retired Air Force Lieutenant Colonel, and attorney—is trying to ride the outsider wave of the general election, he separates himself. "I believe you need a leader," he told the Washington Free Beacon. "And that’s where we’re really drawing that sharp distinction. You have to be willing to go into the areas that people are concerned about. There are underserved areas. It’s not enough to talk about issues, you need to go in there and talk to people and find out what issues they are encountering." "People want to get back to the freedom and liberty principles and actually dust off the Constitution and read it for once," he said. "That’s what I’m trying to advocate for, I’m trying to work within the system but we need pressure from people like you outside the system, to say, ‘We demand our government back.’"
One of the ways he hopes to make an impact as a U.S. senator is getting government out of the way. Glenn said he wants to use his position to meet with community leaders to find solutions to problems such as race relations and law enforcement, without a new government program. That was the theme of the Wednesday night’s event. Hosted by Opportunity Lives, the "Comeback" series starring Speaker of the House Paul Ryan showcases charity groups across the country that are successfully lifting people out of poverty and drug addiction, without government assistance. "What I’m trying to do is get government out of the way and recognize that there’s religious liberty out there and we need to take the fear away from people in faith and in churches," Glenn said. "There are people out there that are pastors that want to step up and lead but they are legitimately scared that they would lose their tax-exempt status. It’s sad to think but it’s holding people back." "And when you are actually able to talk openly and freely, beautiful things can happen," he said. When it comes to race relations, Glenn thinks bringing law enforcement and communities together to talk about things like police-training techniques is more important than slogans. "I’ve missed the memo that all lives didn’t include black lives, blue lives, brown lives," he said. "What I’m trying to do is change the discussion because we’re using talking points instead of really solving problems." Glenn recognizes there are "cultural issues that we must address." As an African-American, he said he has been stopped by police for no reason, and has friends who have never had a positive interaction with police. "There are true issues that are happening," he said. "We are more racially divided today than we were in the previous administration and it’s because there’s an appearance that we’re picking and choosing when we’re going to weigh in on certain issues that are dividing the communities. And I don’t think that’s a good thing." Earlier in the day he held a town hall event in Adams County with law enforcement and community members on race issues and policing. The county sheriff discussed how officers are trained for "shoot/no shoot" situations, and ideas on how to recruit new police officers from within communities to build trust. "My role as a senator is going to be facilitating those discussions not from a policy standpoint but from a leadership standpoint," Glenn said. "You don’t need to support a government program, but I certainly can demand an audience and show them we need to talk and let’s map out a way to do this." Glenn is currently trailing Bennet by 7 points, according to the current Real Clear Politics average. But Glenn doesn’t care too much for polls. "We don’t really follow the polls, but even the polls that people tend to look at we’re already within 7 [points] and we really haven’t started our aggressive campaign yet, as far as on the airwaves with commercials," he said. "You have a sitting senator that has very low name ID. He’s spent millions and millions of dollars and he’s only up by 7 points. And he’s under 50 percent when you start looking at his favorability." "These are major areas of concern there, they are very scared and they should be," Glenn said. Glenn said he is drawing a sharp contrast with Bennet for his vote for Obamacare, and the Iran deal, which the Democrat claims is "going well." Glenn challenged Bennet to "look at a member of the military or their family in the face" and say the deal is going well after revelations that billions in secret cash payments were made to Iran, the leading state sponsor of terrorism. "[Bennet has] been really in lock step with the current administration and the special interests, that’s been the overwhelming message we’ve been hearing on the campaign trail," Glenn said. "So we’re very happy with where we’re at, we’re very confident that we’re going to win this race." "I’m having a great time but this is about empowering you to take back your government," he said.